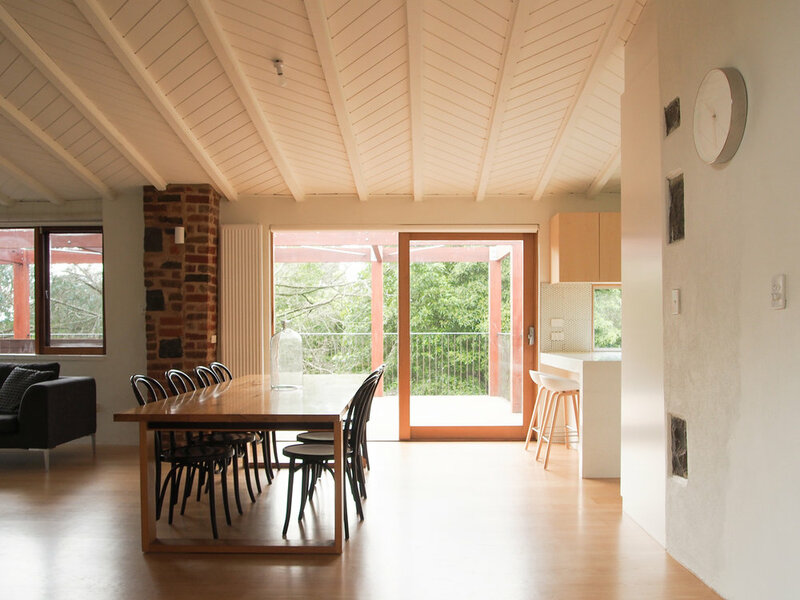 Preserving the stronger elements of the existing house including exposed and painted brickwork, bluestones and timber beams new materials and elements were installed to rejuvenate the home. A new solid oak timber floor and painting the ceiling white creates a feeling of a light filled and spacious interior. Numerous variations of junctions and details were considered to ensure the new additions seamlessly integrate with the existing. Externally a new large ironbark deck creates an outdoor living space at the floor level of the living room and kitchen to function as a primary outdoor space. Elevated in the canopy of the trees and supported by large reclaimed solid ironbark timber posts the new deck has the same solidity and presence as the masonry of the existing house. Over the next few years grape vines will cover the timber frame and provide natural screening, greenery and colour to the deck and living areas blending the structure into the landscape.